Well, I'm baaack! After a month of studying, no sewing (no fun! ), and 645 ignored posts in my blog reader, I'm happy to make a triumphant return to the sewing blog world. My first project back ticks the boxes for both selfless and social sewing: cat pillows for one of my bffs and my entry into Miss Crayola Creepy's Cat Lady Sewing Challenge. Who says you can't participate if you don't own cat?! For my friend's birthday, she requested pillows of her beloved feline, Lucifer "Lucy" Chao. We were inspired by these animal pillows we saw in a shop in Austin, and so I made some up for her featuring pop-art renditions of Lucy. Each pillow has a different image on the front, and a coordinating color on the back. 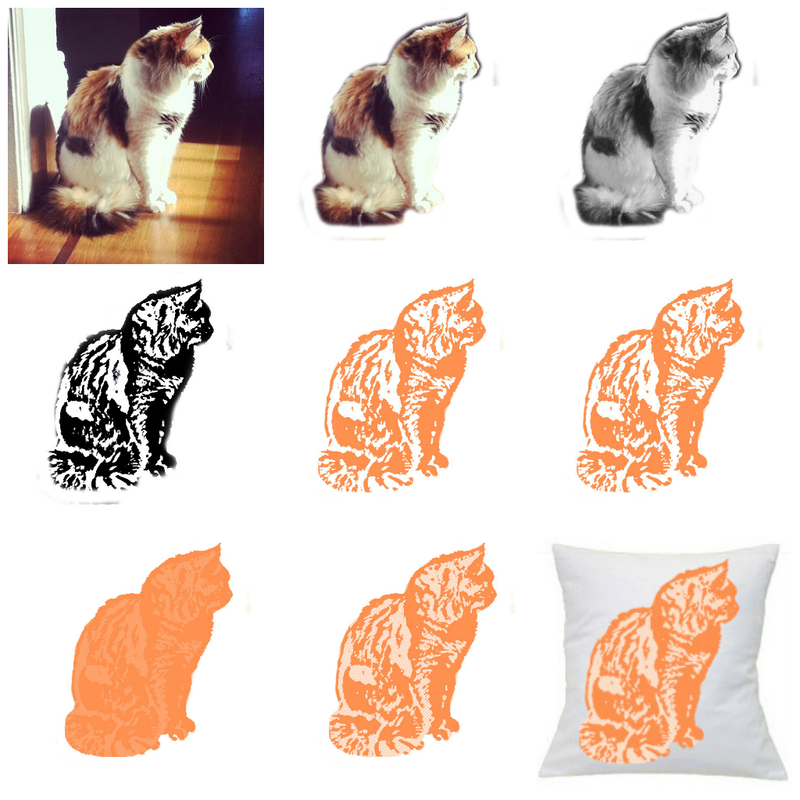 I had Mr. Made blow up my images in Illustrator (complete with cutting lines), and sent it off to Spoonflower. While I had heard a lot about the service, this was my first time using Spoonflower and I have to say that I'm impressed! For $18.75 including shipping, they printed up my exact images on a yard of fabric and had it mailed to me in under two weeks. The cotton was a bit more sheer than I had expected, but the colors were true and bright. Of course, the yardage isn't cheaper than most fabrics you can get in a fabric shop, but for a special-occasion custom print I was very happy. Including custom fabric printing, coordinating fabric, and the pillow inside each cover, the total cost for each came to less than $10 per cushion. The pillow cases themselves are just an envelope design, meaning no zip closures (similar to this tutorial). I used the selvages so I didn't have to hem around the opening, and they came together in under an hour. Of course, I couldn't leave our new puppy Beatrix out of the fun (I am most definitely a crazy dog lady now). With three images for my friend, there was space for one more of B. Ours is in a black and white style that more closely fits our decor, with a black backing. I can't tell if B likes it or is just confused! clever. I am not a fan of cats but the last photo of your dog and pillow is priceless ! Oh, these are great! Thanks for mentioning the cat sewalong, I'm definitely getting involved. and Beatrix is incredibly photogenic, I love her pose. TOO QT! LUCY WILL LOVE THEM! I love, love, love, love them!!! Your puppy is so cute, too, I love that little face!